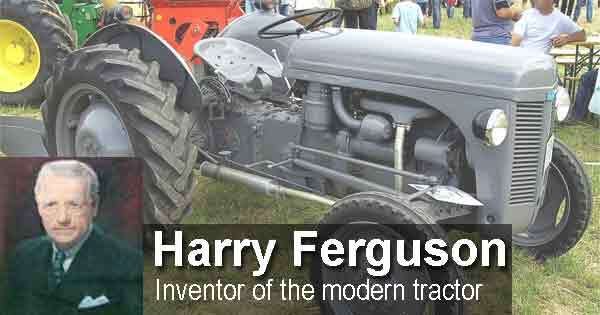 Today is the birthday (1884) of Henry George “Harry” Ferguson, an Irish-born, British mechanic and inventor who is noted for his role in the development of the modern agricultural tractor and whose name lives on in the name of the Massey Ferguson company. Ferguson was born in Growell, near Dromore, in County Down, present-day Northern Ireland, the son of a farmer, of Scottish descent. In 1902, Ferguson went to work with his brother, Joe, in his bicycle and car repair business. While working there as a mechanic, he developed an interest in aviation, visiting air shows abroad. In 1904, he began to race motorcycles. 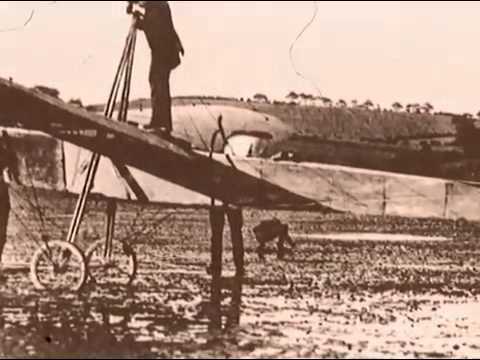 The first person to accomplish powered flight in the UK was Alliot Verdon Roe in June 1908, who flew a plane of his own design, but this feat had not yet been achieved in Ireland. Ferguson began to develop a keen interest in the mechanics of flying and travelled to several air shows, including exhibitions in 1909 at Blackpool and Rheims where he took notes on the design of early aircraft. Harry convinced his brother that they should attempt to build an aircraft at their Belfast workshop and working from Harry’s notes, they worked on the design of a plane, the Ferguson monoplane. After making many changes and improvements, they transported their new aircraft by towing it behind a car through the streets of Belfast up to Hillsborough Park to make their first attempt at flight. They were initially thwarted by propeller trouble but continued to make technical alterations to the plane. After a delay of nearly a week caused by bad weather, the Ferguson monoplane finally took off from Hillsborough on 31st December 1909. 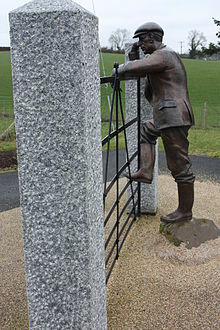 Harry Ferguson became the first Irishman to fly and the first Irishman to build and fly his own plane. After falling out with his brother over the safety and future of aviation Ferguson decided to go it alone, and in 1911 founded a company selling Maxwell, Star, and Vauxhall cars, and Overtime Tractors. Ferguson saw at first hand the weakness of having tractor and plough as separate articulated units, and in 1917 he devised a plough that could be rigidly attached to a Model T Ford car—the Eros, which became a limited success, competing with the Model F Fordson. In 1917 Ferguson met Charles E. Sorensen while Sorensen was in England scouting production sites for the Fordson tractor. They discussed methods of hitching a plough to the tractor to make them a unit (as opposed to towing the plough like a trailer). In 1920 and 1921 Ferguson demonstrated early versions of his three-point linkage on Fordsons at Cork and at Dearborn. 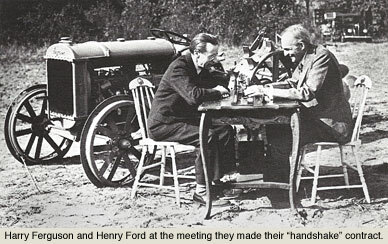 Ferguson and Henry Ford discussed putting the Ferguson system of hitch and implements on to Fordson tractors at the factory, but no deal was struck. At the time the hitch was mechanical. Ferguson and his team of longtime colleagues, including Willie Sands and Archie Greer, soon developed an hydraulic version, which was patented in 1926. After one or two false starts, Ferguson eventually founded Ferguson-Sherman Inc., with Eber and George Sherman. The new enterprise manufactured the Ferguson plough incorporating the patented “Duplex” hitch system mainly intended for the Fordson “F” tractor. Following several more years of development, Ferguson’s new hydraulic version of the three-point linkage was first seen on his prototype Ferguson “Black”, now in the Science Museum, Kensington, London. A production version of the “Black” was introduced in May 1936, made at one of the David Brown factories in Huddersfield, Yorkshire, and designated Ferguson Model A tractor. In 1938, Ferguson’s interests were merged with those of David Brown to create the Ferguson-Brown Company. 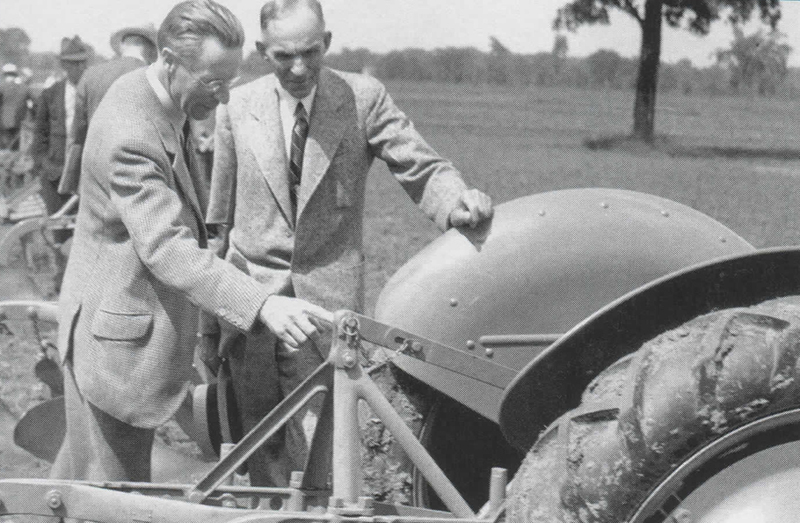 In October 1938, Ferguson demonstrated his latest tractor to Henry Ford at Dearborn, and they made the famous “handshake agreement”. Ferguson took with him his latest patents covering future improvements to the Ferguson tractor and it is these that led to the Ford-Ferguson 9N introduced to the world on 29th June 1939. The 1938 agreement intended that the Ferguson tractor should also be made in the UK at the Ford Ltd factory at Dagenham, Essex but Ford did not have full control at Dagenham and, while Ford Ltd did import US-made 9N/2Ns, Dagenham did not make any. Henry Ford II, Ford’s grandson, ended the handshake deal on 30th June 1947, following unsuccessful negotiations with Ferguson, but continued to produce a tractor, the 8N, incorporating Ferguson’s inventions, the patents on almost all of which had not yet expired, and Ferguson was left without a tractor to sell in North America. Ferguson’s reaction was a lawsuit demanding compensation for damage to his business and for Ford’s illegal use of his designs. The case was settled out of court in April 1952 for just over $9 million. The court case cost him about half of that and a great deal of stress and ill health. By 1952, most of the important Ferguson patents had expired, and this allowed Henry Ford II to claim that the case had not restricted Ford’s activities too much. Naturally, all the world’s other tractor manufacturers could also use Ferguson’s inventions, which they duly did. 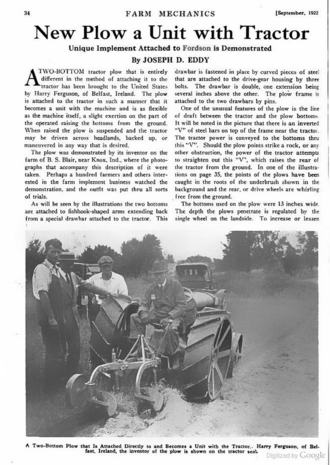 A year later Ferguson merged with Massey Harris to become Massey-Harris-Ferguson Co, later Massey Ferguson. As a consequence of Dagenham’s failure to make the tractors, Harry Ferguson made a deal with Sir John Black of the Standard Motor Company to refit their armaments factory at Banner Lane, Coventry. Production of the latest Ferguson tractor, the TE20, started in the autumn of 1946, with over 20,800 TEs being built by the end of 1947. To fill the gap in Ferguson’s sales in the US, thousands of TEs were shipped over from England. Production of a US version, the TO20, started at a new plant, owned by Harry Ferguson Inc, in October 1948, leaving the UK plant to supply the rest of the world. Ferguson’s research division went on to develop various cars and tractors, including the first Formula One four-wheel-drive car. Ferguson’s four-wheel drive system, using an open center differential gear, was used in Formula One race cars and in the Range Rover and later in constant four-wheel-drive Land Rovers. A northern Irish dish is in order, even though Ferguson spent most of his business life in England. 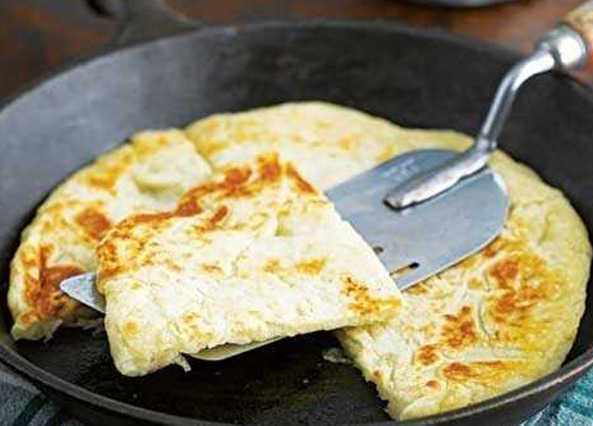 I have given a recipe for farls made with flour already http://www.bookofdaystales.com/typhoid-mary/ so here are potato farls. Potatoes are, of course, the great staple of Irish farming and cooking. Boil the potatoes for about 20 minutes, or until soft. Turn off the heat. Drain the potatoes and return them to the pot to let them dry out. Mash the potatoes with a fork or potato masher until smooth. Place the warm mashed potato in medium bowl. Stir in the flour, melted butter, and salt to taste. Mix lightly until you have a dough and no pockets of dry flour. Knead the dough lightly on a floured surface. Use a floured rolling pin to flatten the dough into a 9 inch circle about ¼ inch thick. Cut into quarters. Sprinkle a little flour into the base of the skillet on medium-high heat and cook the farls for 3 minutes on each side or until evenly browned. Serve immediately. 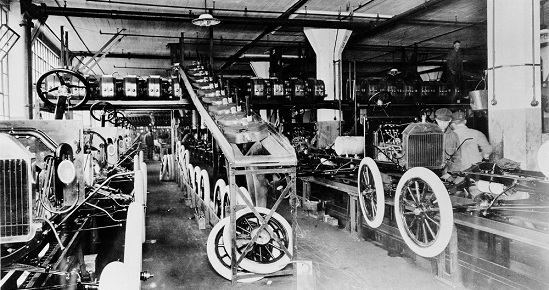 According to some sources, the world’s first moving assembly line began operation at the Henry Ford Company in 1913. The actual date of initial operation is subject to debate, but I’ll use this one. 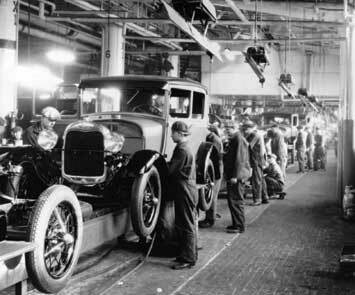 The moving assembly line was a monumental revolution in the production of cars, and, ultimately in mass production in general. On the positive side, I suppose, the moving assembly line was a giant leap forward in producing relatively inexpensive cars for the masses, and his methods were known at the time as Fordism. On the not-so-positive side, Ford’s innovation spawned repetitive, dull labor, mass consumption of identical cars, and traffic jams. I’m a colossal fan of handmade goods and public transport. The main point to understand is that Ford did not invent the assembly line; that has a very long history. He invented the moving assembly line. The assembly line in general is practically as old as civilization. Any system in which a product moves from one person to the next for the addition of components is an assembly line. So, for example, in a professional kitchen a plate can move from the roast station to the vegetable station to the sauce station and then out to the diner. 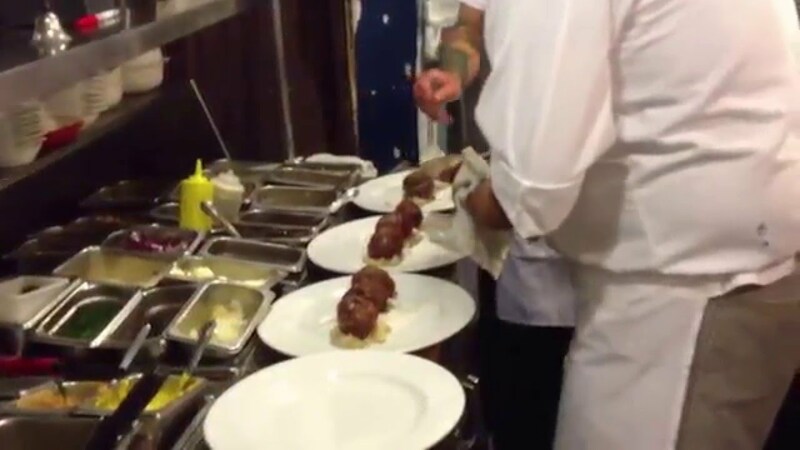 Three different chefs have added a component to make the plate complete. Ford made several changes to increase efficiency and speed in assembly. First, he standardized the components; second he standardized the actions on the assembly line; and third he created a constantly moving conveyer belt so that the cars moved from one assembly point to the next. His innovation cut the assembly time for a car from about 12 hours by hand to about 2½ hours on the moving line. With mass produced standard parts there was no time wasted getting components to fit, as there is in hand manufacture. Building a car using Ford’s method is just like building a house using lego blocks. Every component fits where it should on the car because the car has a completely uniform construction, which means that every car is identical and all the parts are interchangeable. The components are fitted together in carefully regulated steps. 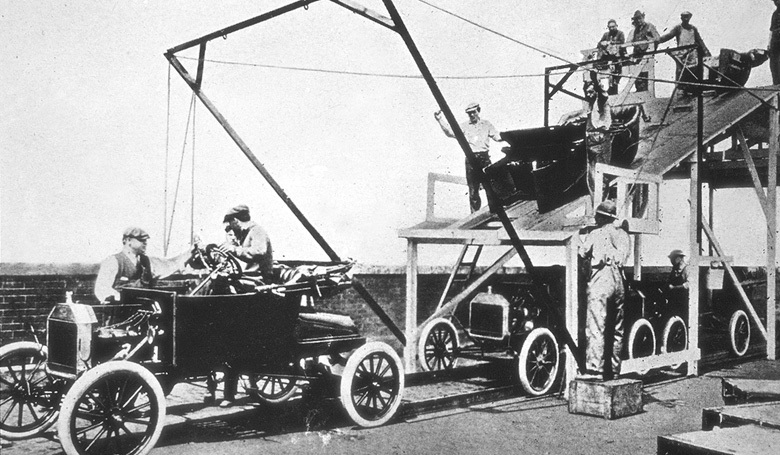 Ford had time and motion experts calculate the precise number of steps (87) needed to construct a car, as well as the order and most efficient way to organize the construction. The moving conveyer belt meant that the cars under construction moved from station to station where workers had the parts ready to attach. The workers were trained in the one task each had to manage so they could perform it quickly. In consequence a car rolled off the assembly line every 3 minutes. That’s great for mass production, but not so great in other ways. Assembly line production in this manner has two major flaws, in my opinion. First, it produces endless copies of the original model. Ford is famous for saying that you could have the model-T in any color you wanted as long as it’s black. Nowadays assembly line production has some variety built in but in Ford’s day it was the continual production of identical models that was one key to low cost. In addition, Ford’s innovation made labor repetitive (that is, boring). If you are trained to fit driver-side doors on the cars, that’s all you do 8 hours a day, 5 days a week. That reduced Ford’s labor costs, because such work is not skilled labor, and, like parts, one line worker can easily be replaced by another if one gets sick or is inefficient. 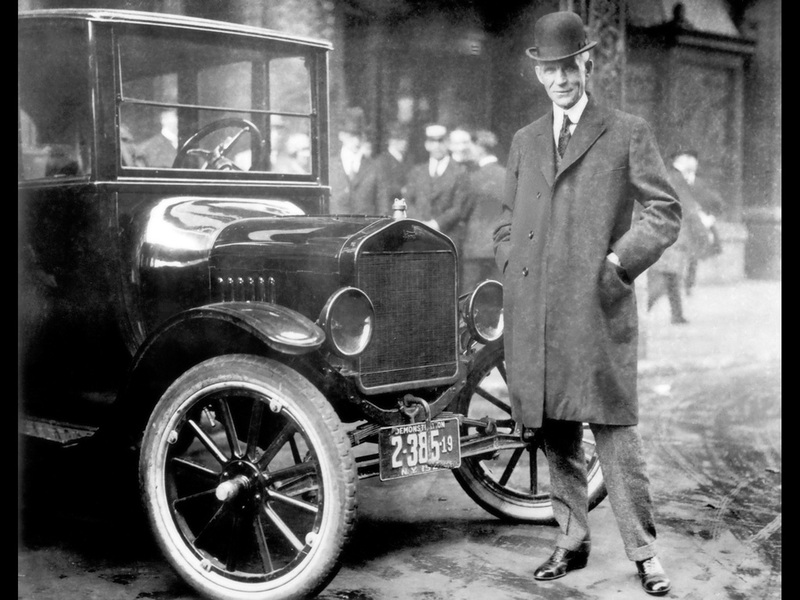 Ford paid decent wages and the work was steady because demand for his cars was high. But the work itself was dehumanizing. Like industrial production, assembly-line cooking has its pluses and minuses. At its worst we end up with mass-produced fast food that may be cheap but has few redeeming features beyond filling an empty belly. But assembly-line cooking is not all bad, and sometimes results in something special. As the name implies a line cook is a cook working on a culinary assembly line, and busy restaurants, even the fanciest, cannot always produce every dish, one plate at a time assembled by a single cook. At home I occasionally need to use assembly line techniques, especially when I am cooking for a crowd, and pretty much always when I am having a dinner party. Cooking shows on television often make a big deal out of plating a meal. I don’t do that at home. I do not assemble plates in the kitchen and then bring them to the dining table ready to eat. My guests have empty plates and I bring all the dishes to the table. They then circulate, and guests help themselves as the different components pass. So it’s like an assembly line except in this case it is the components that move and the finished product stays in one place. The finished product is not as elegant as it would be if I made each dish in the kitchen, but the seeming paradox here is that by using a moving assembly line for all the components, each diner’s plate is unique. Assembly lines do not have to result in identical products. There is also a certain amount of efficiency to using assembly line methods in the kitchen. So, for example, if I have 4 apples to peel, core, and slice. I could peel, core and slice the first, then the second, and so on, and that’s what I used to do for a long time. But now I peel all 4, then core all 4, then slice all 4. When I managed a catering company and when I directed church suppers, we always had assembly lines.